Branch Network – CB Lanka Microcredit ltd.
Trincomalee CB Lanka Microcredit Ltd.
Kalmunai CB Lanka Microcredit Ltd.
Rikillagaskada CB Lanka Microcredit Ltd.
Kegalle CB Lanka Microcredit Ltd.
Galle CB Lanka Microcredit Ltd.
Uhana CB Lanka Microcredit Ltd.
Tambuttegama CB Lanka Microcredit Ltd.
Horowpattana CB Lanka Microcredit Ltd.
Monaragala CB Lanka Microcredit Ltd.
Elpitiya CB Lanka Microcredit Ltd.
Puttlam CB Lanka Microcredit Ltd. 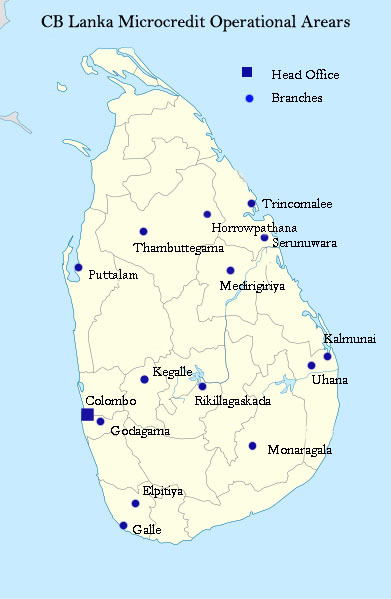 Operational Areas: Wanathavillluwa, Karuwalagaswewa, Mundalama, Kalpitiya, Anamaduwa, Puttalam. Head Office Branch CB Lanka Microcredit Ltd.
Serunuwara CB Lanka Microcredit Ltd.
Operation Areas : Eichchilampattu, Serunuwara, Kiliveddy, Mutur. Medirigiriya CB Lanka Microcredit Ltd.